Swift which is one of Nigeria's leading 4G LTE Broadband service provider has just officially launched a Free WiFi service in Lagos Nigeria which is calls "Red Cheetah". Swift has been test running this for the past two years and now, the company has decided to make it available to the general public. According to Swift, they have already created up to 500 hotspots in Lagos state alone including 250 BRT buses and the hope is to get to 10,000 locations in Lagos state alone and subsequently expand the service to all other parts of the country. The service is already available in locations like MMA-2, Hard Rock Café, Shiro restaurant, Festival Mall, some Tastee Fired Chicken and Bukka Hut outlets, over 200 BRT Buses, Smart Cabs, Eko Hospital, VGC Club. Businesses who would like to be a part of the service can also opt in by paying a one-time fee of N30,000. The Red Cheetah service can be accessed through a free app which you you can register on multiple devices simultaneously. Even though the plan is to provide unlimited free internet service, the Red Cheetah service is still capped at 1gb daily per device for now. 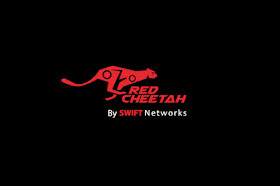 To be able to offer this service free of charge, Swift Networks is partnering with brands to serve ads to users on the Red Cheetah platform. This means that to keep browsing free, users are obliged to watch ads during their session. "Red Cheetah is supported by some corporate sponsors to keep Nigerians connected to the fastest and highest quality broadband access that will enable them to continue to achieve more, wherever they are.Subscribers to this service will periodically be required to view advertisement messages from the various sponsors who have made this service free." To take advantage of this free internet service, you need to download the Red Cheetah App from Google Play Store. Windows and iOS versions of the app will be available in the next 3 months. Note: Even with the app on your phone, you will only be able to use this service in areas where the Red Cheetah Modem is available. For more information, you can visit the official website by clicking on this LINK.